Just Listed! More photos available soon! New to market rare find 61’ Garlington. 3/3 layout with 10V 2000 MTU power pushing her to a 35kt cruise and 45kt top end speed. (2) Northern Lights 20kw gens, many upgrades in the last year including new teak deck, mezzanine, Garmin electronics with (2) 8617 displays, chirp sounder, 72 mile radar. Additional equipment includes water maker, Eskimo ice, underwater lights, etc. Too many upgrades to list. Won’t last! 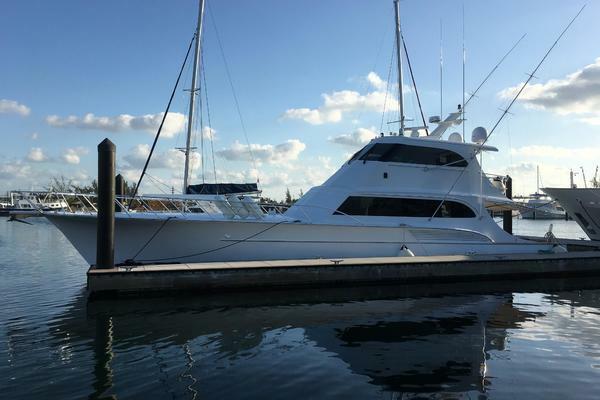 United Yacht Sales New Jersey would love to guide you through a personal showing of this 61' Garlington Sportfish 2009. This yacht for sale is located in Wrightsville, North Carolina and priced at $2,190,000. For a showing please contact us by filling out the form on this page and we will get back to you shortly! All new Garmin electronics Pulpit removed New curtains New outriggers New teak cockpit Refinished covering boards New color changing LED lighting, tower, bridge, underwater, cockpit New carpet throughout All new furniture in salon New microwave New stovetop New water heater New rod holders New AC units New teak toe rail New non-skid on entire bow New bottom paint (April 2018) Props tuned (April 2018) New batteries New governor New mezzanine soft goods New hydraulic steering Clear coat on bright work and more!